Description (from Amazon) «Un libro anticonformista, un contributo serio per una discussione aperta sul movimento sindacale in cui non prevale la retorica e non domina il patriottismo di organizzazione. La globalizzazione, la finanziarizzazione dell’economia e il mercato hanno messo fuori gioco il sindacato. Giuliano Cazzola e Giuseppe Sabella non ne sono convinti, vedono delle opportunità. Sono molto interessanti gli stimoli, a volte le provocazioni, le proposte, i cambiamenti che propongono». Ciò soprattutto in una fase di grande sconvolgimento economico e politico, sia a livello nazionale che internazionale. L’industria e il lavoro sono oggi al centro della grande trasformazione: laddove c’è innovazione ci sono accordi sindacali. La contrattazione di secondo livello, il welfare aziendale, la conciliazione vita-lavoro e, più in generale, il piano industria 4.0 sono sempre più al centro della vita delle imprese: ecco perché il sindacato ha davanti a sé una strada aperta e non scomparirà. My review: 3.5/5 In business, we talk and write a lot about "digital transformation", but most consultants seem to forget that the implementation of changes isn't culture-neutral. A small digression for my non-Italian readers. In Italy, since after WWII gradually until few decades ago trade unions became a structural counterpart to the main industrialists' association, Confindustria. As until few years ago in Italy the State had quite a large presence (having inherited from Mussolini time more than just a foothold in "driving the economy from the ground"), eventually State companies had their own "industrialist's association". Therefore, my interest in this book is biased by specific elements of the Italian business culture, also if until recently a joint management German style was unknown in Italy, also because it would have required a completely different way to promote and develop trade unionists. Since the 1980s, the existing "balance of forces" started showing here and there signs of being not anymore aligned with the realities of the Italian labour market. Specifically, over the last 20 years there was a continuous increase in what is now called "the gig economy"- but applied also where in other countries there would be permanent employees or temp-to-perm (e.g. already a dozen years ago, while working in Rome, met newly graduated 20 something who worked for Ministries with renewable short-term contracts). Digital transformation isn't just about technology, it is about people, career paths, and the overall concept of labour market and work-life balance. The "gig economy" as it is now is really a "Far West of labour", and teleworking is in most cases just traditional work (supposedly) carried out at home. Whenever there is a major change, most analyses consider as a key issue the transition of the existing workforce, forgetting those already in training, those who have been coached to prepare for roles that will not exist anymore, and of course ignoring anybody in retirement. The book focuses mostly on the history of industrial relationship, and various attempts first to create a single, unified, trades unions organization, with national-level contracts valid across the board, and more recent attempts to add flexibility down to the single factory (or even individual worker). The Industry 4.0 element is mainly in the title of the book, as it is only briefly hinted at here and there, as just a couple of dozen of pages discuss today (and hint at what could happen tomorrow, e.g. the resistance to change embedded in the backbone of the Italian economy, small companies). But, frankly, this is more than adequate, as it is better to have authors focused on what they know, than leveraging on the credibility that they derive from their social status to talk about what they do not know or didn't investigate, and then deliver recipes that politicians are way too quick to copycat. Having a knowledge of what is the cultural backgroud of the current status of industrial relations in Italy could help also multinational companies in adapting their global framework to the Italian market- and the book contains a (short) chapter discussing just this issue: industrial relationships within a globalized market. 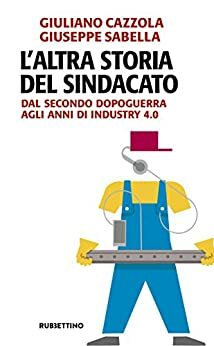 What you will not find in this book is what probably the subtitle "dal secondo dopoguerra agli anni di industry 4.0" would make you expect- an assessment of the position adopted toward the forthcoming transition of our economic model by trades unions and industrialists, from a trades unions perspective. Maybe that will be part of a future book, as just 8 pages at the end discuss the "what's next". Still, worth reading, and much more interesting than other books that, for my change management activities, I read in the past, books focused too much on personalities and too little on industrial relations.